Due to the unprecedented Worldwide shortage of Hawaiian Spirulina, our Hawaiian Pacifica Spirulina products are currently unavailable. We sincerely hope the circumstances in Hawaii soon improve and we’re able to recommence supply to our loyal Australian customers. Meanwhile, we highly recommend our Mountain Organic Spirulina range – the best ‘Certified Organically Grown’ Spirulina in the World with an excellent fresh taste, purity and potency. Spirulina is a microscopic spiral shaped, blue-green vegetable algae. It has been used as a significant food source for centuries. Spirulina is highly digestible and the most nutritious, concentrated whole- food known to humankind. It is nature's richest whole-food source of complete protein. Rich in GLA, it also contains important B complexes including bio-available B12 and other essential organic, whole-food minerals and trace elements. Hawaiian Pacifica Spirulina contains around sixty percent complete, highly digestible protein and contains every essential amino acid. It also contains more beta-carotene than any other whole food. It is the best whole food source of gamma linolenic acid (GLA). It is rich in B vitamins, minerals, trace elements, chlorophyll, and enzymes. 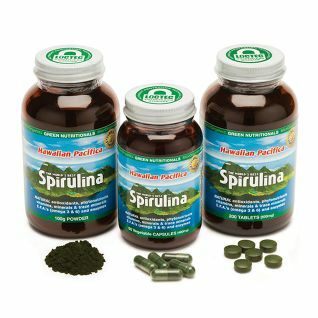 Spirulina is nature's richest whole-food source of naturally occurring organic iron. It's 58 times richer in iron than raw spinach and 28 times richer than raw beef liver. Spirulina is nature's richest source of beta-carotene (pro-vitamin A), it's 25 times higher than raw carrots! You’ve heard the recommendation that we should eat five servings of fresh fruit and vegetables a day. This can be hard to achieve in real life. That’s where powerful supplements come in and help us maintain optimal health and wellbeing. Phytonutrients are natural chemicals found in plants. They differ from essential vitamins and minerals that we need to keep us alive. Phytonutrients function to boost health and body functioning. When it comes to phytonutrient levels, Hawaiian Pacifica Spirulina is 31 times more potent than blueberries, 60 times more potent than spinach and 700 times more potent than apples. Hawaiian Pacifica Spirulina's concentrated nutrition makes it an ideal food supplement for people of all ages and lifestyles. If your brand is Hawaiian Pacifica Spirulina then you're buying The World's Best Spirulina! It contains around sixty percent complete, highly digestible protein and contains every essential amino acid. It also contains more beta-carotene than any other whole food; it is the best whole food source of gamma linolenic acid (GLA); it is rich in B vitamins, minerals, trace elements, chlorophyll, and enzymes; and it is abundant in other valuable nutrients about which scientists are learning more each year, such as carotenoids, sulfolipids, glycolipids, phycocyanin, superoxide dismutase, RNA, and DNA. Hawaiian Pacifica Spirulina supplies nutrients that are lacking in most of our diets. It provides athletes with long-lasting energy and reduces recovery time; it nourishes people who have digestion, assimilation, and elimination problems; it satisfies the appetite as it provides essential nutrients to weight watchers; it enables children and others who don't like vegetables to eat their greens by taking a few tablets; and it helps busy people who don't have time for regular, balanced meals to nourish themselves. People with various health problems swear by Hawaiian Pacifica Spirulina – it appears to promote overall health and well-being. Hawaiian Spirulina Pacifica™ is the only spirulina in the world that uses deep seawater containing many trace minerals during the growing process. Trace minerals are widely recognised for their nutritional benefits. The deep seawater comes from a pipeline that goes down 600 meters (2000 feet) below sea level. This exceptionally pure resource has been untouched by human activity. Scientists estimate that this water has not been in contact with surface waters for over 2000 years! Spirulina is a microscopic spiral shaped, blue-green vegetable algae that's been used as a significant food source for centuries. Spirulina is highly digestible and the most nutritious, concentrated whole- food known to humankind. It is nature's richest whole-food source of complete protein. Rich in GLA, it also contains important B complexes including bio-available B12 and other essential organic, whole-food minerals and trace elements. Spirulina is a rich whole-food source of chlorophyll - equal to that of alfalfa or wheat-grass. It contains a rich spectrum of available proteins and is the richest source of beta-carotene and mixed carotenoids in the world. Spirulina is nature's richest whole-food source of naturally occurring organic iron. It's 58 times richer in iron than raw spinach and 28 times richer than raw beef liver. Spirulina is natures richest whole-food source of the entire anti-oxidant spectrum including: beta-carotene, selenium, superoxide dismutase (SOD), methionine, Steiner, glutathionine Peroxides, copper, manganese, zinc, B-1, B-2, B-3, B-5, and B-6. It is the only source of phycocyanin (the 'blue pigment' phytonutrient) which is a powerful immune stimulant. Beta-carotene in Spirulina is completely non-toxic, even in mega doses. Hawaiian Spirulina is a select strain of arthrospira platensis developed over many years of continuous cultivation in Hawaii. The Hawaiian Spirulina strain development and perfection started in 1984. The cultures grown by Cyanotech in Hawaii represent the oldest continuously cultivated and harvested spirulina in the world. Hawaii's year-round grown conditions and integrated culture management system have made this possible. Hawaiian Spirulina has been extensively analysed by molecular biologists at the University of Hawaii who identified unique enzymes not previously found in other strains of spirulina platensis. For convenience and a quick nutritional boost any time, our tablets or capsules can be carried in a purse, backpack or suitcase. Keep some at home and some at work. Hawaiian Pacifica Spirulina can go everywhere with you. A serve is six tablets or capsules, but you may prefer to use a bit less. Spirulina is a dry food so don't forget to drink plenty of water. Hawaiian Pacifica Spirulina Powder is 100% pure and can be shaken into fruit juice in any closeable container such as a drink bottle, blended with fruit or stirred into yoghurt. It's delicious! For a simple Spirulina super-shake, just pour some juice into a container that can be sealed – even a jam jar, then add a heaped teaspoon of Spirulina powder (keep the spoon dry!) put the lid on and shake briefly. Spirulina will not dissolve, it just goes into suspension, so if after a while the Spirulina falls to the bottom, just give it another shake. Powder can be shaken into fruit juice, blended with fruit (try ripe papaya with a dash of lime) or stirred into yoghurt, taken like this it tastes great! Hawaiian Pacifica Spirulina is a specially bred strain of the edible micro-algae spirulina platensis. It is cultured in shallow, open ponds (approximately 20 cm deep) in Hawaii, adjacent to the Pacific Ocean. A combination of fresh Hawaiian aquifer (potable) water and supplemental mineral rich Deep Ocean water is used to fill the ponds. The other major components required for growing Hawaiian Pacifica Spirulina are food-grade baking soda (sodium bicarbonate) and carbon dioxide. Food grade fertilisers are used and the deep sea water is added as a rich source of minerals and trace elements. Paddle wheels agitate the water, ensuring even exposure of the algae to the sun for optimal growth and nutritional value. 350 metric tons of premium-quality Spirulina Pacifica are grown each year at Cyanotech's 80-acre Hawaiian, ocean-front production facility. Once the spirulina is harvested fresh from the ponds, it is imperative that the important, sensitive nutrients it contains are protected against damaging oxidation. One of the unique methods used by Cyanotech to protect against oxidation is in the drying method. Patented Ocean-Chill Drying™ protects phytonutrients and enzymes. Spirulina provides a wide range of delicate phytonutrients with very significant health benefits. To reduce processing losses of these delicate compounds Cyanotech have developed and patented Ocean Chill Drying™. This is a process whereby the air used in the spray drier is put through a column of cold, deep ocean water pumped up from 2000ft. This 'rips' the oxygen from the dryer's air, exposing the spirulina to far less oxidation than with conventional spray drying, and retaining much higher levels of delicate nutrients such as beta-carotene and superoxide-dismutase than all other brands. All Hawaiian Spirulina is dried with this process, giving it much higher levels of phytonutrients and enzymes. Once dried, tablets are made on the farm in Hawaii using a cold pressed process (no heat, no "wet-granulation"). Hawaii has unique environmental advantages for superior spirulina production. The waters off-shore are classified 'Class AA' as the cleanest coastal waters in the United States , and visibility is typically 150 feet. It's year round high temperature, prolonged bright sunlight and pristine air and ocean make it the ideal location to grow your daily food supplement. Only Hawaiian Spirulina draws nourishment from the world's cleanest, deepest ocean. Our facility uses ocean water drawn from a pipeline that goes down 2000 feet into the sea. Oceanographers tell us this water has been below the surface for over 2500 years. Deep water from the Pacific makes a very slow migration that starts at the poles. This deep water stays in a distinct layer, travelling like a very slowly moving river toward the tropics. Our pipeline brings this ultra-pure, mineral rich water to our ponds. We supplement our spirulina with this deep water as a source of calcium, magnesium, and all the essential trace elements. No other spirulina is grown with such a rich source of naturally occurring nutrients. Hawaiian Spirulina Pacifica™ is the only spirulina in the world that uses deep seawater containing many trace minerals during the growing process. Trace minerals are widely recognised for their nutritional benefits. The deep seawater comes from a pipeline that goes down 600 meters (2000 feet) below sea level. This exceptionally pure resource has been untouched by human activity. Scientists estimate that this water has not been in contact with surface waters for over 2000 years! KAILUA KONA, Hawaii (March 5, 2009) — Cyanotech Corporation (NASDAQ: CYAN), a world leader in producing high-value nutrition and health products from micro-algae, today announced the results of nutritional comparison testing between Hawaiian Spirulina Pacifica®, California Spirulina and Indian Organic Spirulina. "We are ecstatic over the results," said Andrew H. Jacobson, Cyanotech President and CEO. "We have always been recognised as a global nutrition leader and these results make following the leader much harder." An independent third-party lab tested the nutritional content in three grams of Spirulina powder and the results clearly identified Hawaiian Spirulina Pacifica as the leader in nutrition. "These results reinforce and confirm our exceptional value proposition and nutritional leadership in the marketplace," Jacobson continued. "The combination of our continuous cultivation methods, strict quality standards, patented Ocean Chill™ drying technology, and unique location in a BioSecure Zone free from pollution ensures we produce the purest and most superior Spirulina in the world. Hawaiian Spirulina Pacifica has the highest nutritional content available among competing Spirulina brands." Hawaiian Spirulina Pacifica is exclusively cultivated in an environment most similar to nature, using 100% potable drinking water from Hawaiian aquifers, and pure deep ocean water with 94 trace minerals to deliver a superior product with the highest nutritional content available. *Nutritional Content Disclaimer: The information contained herein is made available to the public by Cyanotech Corporation. The new nutritional content and competitor comparisons reported for Cyanotech's Hawaiian Spirulina Pacifica are based on analytical results from an independent third-party laboratory, with the exception of Vitamin A, which is based entirely on label claims. Over the years, concerns have surfaced regarding the presence of BMAA's (b-N-methylamino-L-Alanine) in some groups of naturally occurring blue green algal growths. Whilst the presence of these substances in wild blue green algal growths in lakes and waterways has been detected, there have been no reports of it ever being found in Spirulina. To alleviate concerns, Cyanotech, grower of Hawaiian Pacifica Spirulna, has submitted samples of Hawaiian Spirulina for independant testing. No trace of BMAAs have been detected in this testing. KAILUA KONA, Hawaii--(BUSINESS WIRE)--June 8, 2005--Cyanotech Corporation (Nasdaq:CYAN) a world leader in producing high-value natural products from microalgae, today announced the results of testing done at the Department of Biological Sciences at Wright State University (Dayton, Ohio), on Spirulina Pacifica confirming the absence of BMAA. An article, "Diverse taxa of cyanobacteria produce b-N-methylamino-L-Alanine, a neurotoxic amino acid" by Cox et al., appeared in the April 2005 issue of the Proceedings of the National Academy of Sciences (PNAS 102:5074-5078). This study showed a potential toxin, BMAA, was found in diverse groups of cyanobacteria, which may have raised some concern over the safety of Spirulina, a product sold worldwide as a dietary supplement. On April 13, 2005, Cyanotech Corporation filed a Form 8-K with the Securities & Exchange Commission in response to a press release issued by Earthrise Nutritionals, LLC which cited such concern and mentioned Cyanotech. Spirulina (Arthrospira) was not included among the 30 types of cyanobacteria tested and referenced in the article. Cyanotech, however, took the precautionary measure of submitting samples of its spirulina products for independent testing for BMAA. The Company first approached Dr. Paul Alan Cox, the primary researcher and co-author of the PNAS article, who did not respond to the request. The Company then enlisted the services of Professor Wayne W. Carmichael to test its Spirulina product. Professor Carmichael is a full Professor in the Department of Biological Sciences at Wright State University and a leading expert in the field of cyanobacterial toxins. On June 3, 2005, Professor Carmichael reported his findings confirming the absence of detection levels of the suspected neurotoxin BMAA in Cyanotech's Spirulina Pacifica. "The results of the test confirm that our Spirulina contains no trace of BMAA and we are pleased to provide this reassurance to our customers of the integrity of our products," said Gerald R. Cysewski, Ph.D., Chairman, President and Chief Executive Officer. "One of the primary goals of Cyanotech is to offer microalgal products which provide high value to our customers and this affirmation of the absence of detectable BMAA in our Spirulina is further evidence of our commitment to quality and safety of our products." Re: The publication “ Diverse taxa of cyanobacteria produce ?-N-methylamino-L-Alanine, a neurotoxic amino acid” by Cox et al. 2005. PNAS 102: 5074-5078. This publication that appeared in the April 2005 issue of the Proceedings of the National Academy of Sciences has caused a lot of concern among consumers of Spirulina. Cyanotech Corporation and Earthrise Nutritionals, LLC provide the following response regarding this report. While the study shows that a potential toxin, BMAA, occurs in diverse groups of cyanobacteria, it did not test for BMAA in Spirulina (Arthrospira). Spirulina is not mentioned in the list of 30 different types of cyanobacteria tested. We have requested Dr. Cox to test our Spirulina products in his laboratory in order to find out the presence or absence of BMAA. When similar studies found out that microcystins were present in a wide variety of cyanobacteria, Earthrise and Cyanotech took the proactive step of funding research toward the development of methods for the analysis of mcirocystins and began certifying their products as microcystin free. We have been doing so for almost ten years. Our microcystin method was developed in cooperation with Dr. Wayne Carmichael who is a leading expert in cyanobacterial toxins. We will approach leading experts in this area and take a similar step to address the current problem. We have not received any complaint concerning health problems related to neurological conditions. On the contrary, the antioxidant and anti-inflammatory effects of Spirulina have been demonstrated in several animal studies. These studies have show that the antioxidants in Spirulina scavenge oxygen radicals and help in promoting brain health. Centuries of safe human use as food by the Aztecs in Mexico, and the Kanembu in Chad. Rigorous safety testing including one of the most comprehensive Spirulina animal studies sponsored by the United Nations Industrial Development Organization (UNIDO) using rats and mice. In this study, Spirulina was incorporated into the food at 10-35% of the total diet. There were no problems with second or third generation reproduction, fertility, lactation or birth defects found. No cancer causing properties were found. No significant problems with heavy metals, nucleic acids, pesticides or bacteria were found. Subsequent tests in many countries have proven the safety of Spirulina. Both Hawaiian Spirulina and Yaeyama Chlorella are freshwater microalgae and are NOT grown in the ocean. Both are grown on the land in environmentally controlled food-grade ponds where the fresh water quality and purity of the microalgae species can be maintained. Both the islands on which Hawaiian Spirulina (Big Island of Hawaii) and Yaeyama Chlorella (Ishigaki Island, Yaeyama) are grown DO NOT receive either low level or high level winds or Ocean currents from the Japanese mainland. Since the Fukishima disaster occurred, continuous independent testing on both Hawaiian Spirulina have shown NO detectable radiation.